The FenderGrip® - Faster, Better, Stronger! Push button speed plus the strength of your fender line. Only the Fendergrip gives you instant push button fender height adjustment plus a positive lock. Makes fender adjustments a breeze, yet installs in seconds to cleats, grab handles, and rails of any size or shape. 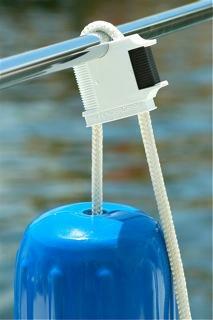 Uses your 3/8" to 1/2" line's strength to hold fenders of all sizes. Made of rugged DuPont Delrin® and stainless steel hardware. At home on any boat from a 13 foot Boston Whaler, to a 27 foot Sea Ray, to Million Dollar Yachts, and Megayachts. Also used by the U.S. Coast Guard and Marine Police Agencies. Stores fenders on rails or life-lines instead of in bulky fender racks. Also stores with fender. Sold individually.